Mark Frary, of Fakenham, was one of just 12 winners across the country in a national Toolbank power tools contest. Mr Frary won a Dewalt Mega Kit after entering the GO Wild Real Deals Christmas promotion at FTC Hire and Sales in Fakenham. 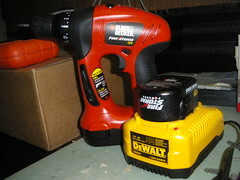 Complete a variety of projects around your home with ease using this DEWALT Lithium-Ion Cordless Oscillating Multi-Tool.